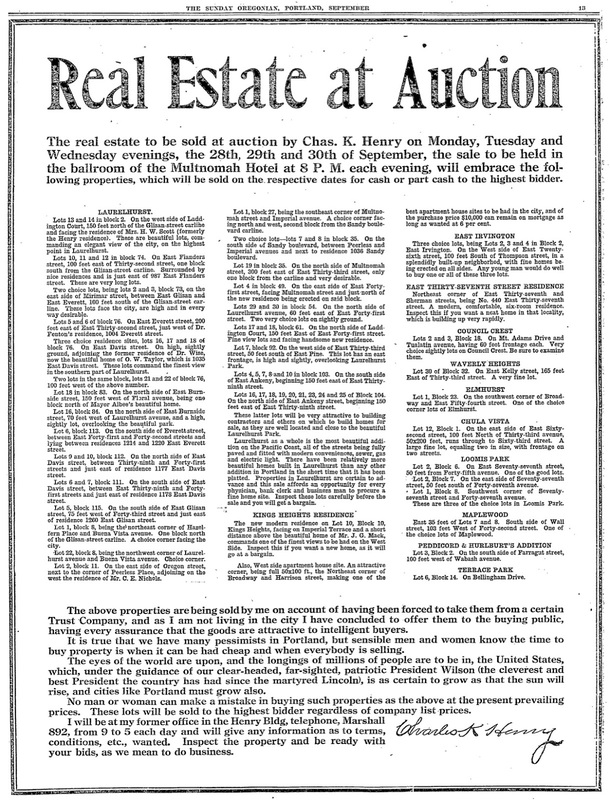 The real estate to be sold at auction by Chas. 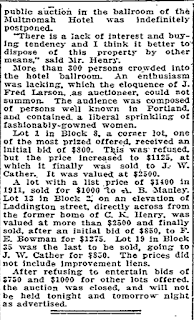 K. Henry on Monday, Tuesday and Wednesday evenings, the 28th, 29th, and 30th of September, the sale to be held in the ball room of the Multnomah Hotel at 8PM each evening will embrace the following properties, which will be sold on the respective dates for cash or part cash to the highest bidder. The above properties are being sold by me on account of having been forced to take them from a certain Trust company, and as I am not living in the city I have concluded to offer them to the buying public, having every assurance that the goods are attractive to intelligent buyers. It is true that we have many pessimists in Portland, but sensible men and women know the time to buy property is when it can be had cheap and when everybody is selling. The eyes of the world are upon, and the longings of millions of people are to be in, the United States, which, under the guidance of our clear-headed, far-sighted, patriotic President Wilson (the cleverest and best President the country has had since the martyred Lincoln), is as certain to grow as that the sun will rise, and cities like Portland must grow also. No man or woman can make a mistake in buying such properties as the above at the present prevailing prices. These lots will be sold to the highest bidder regardless of company list prices. I will be at my former office in the Henry Bldg, telephone, Marshall 892, from 9 to 5 each day and will give any information as to terms, conditions, etc., wanted. 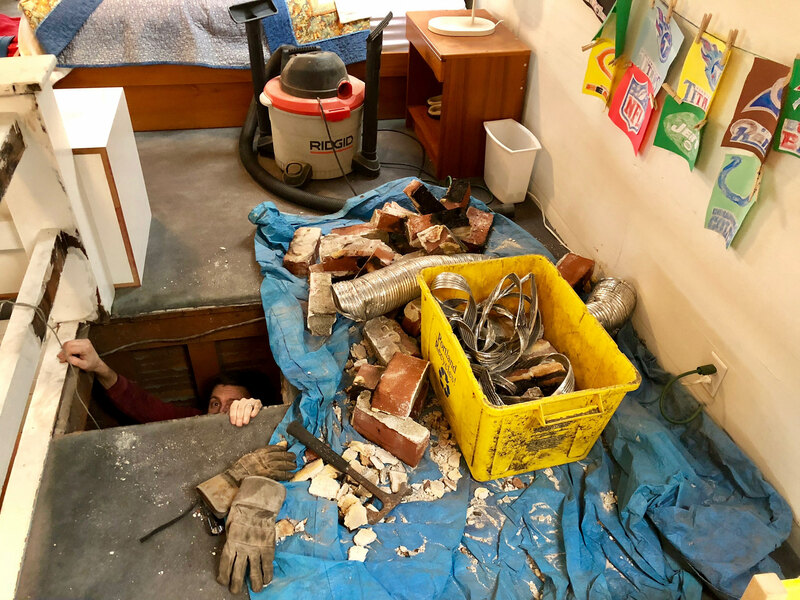 Inspect the property and be ready with your bids, as we do mean business. 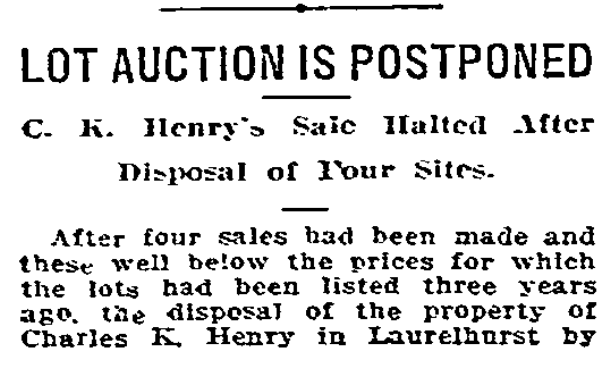 After four sales had been made and these well below the prices for which the lots had been listed three years ago, the disposal of the property of Charles K. Henry in Laurelhurst by public auction in the ball room of the Mulnomah Hotel was indefinitely postponed. "There is a lack of interest and buying tendency and I think it better to dispose of this property by other means," said Mr. Henry. More than 800 persons crowded into the hotel ballroom. 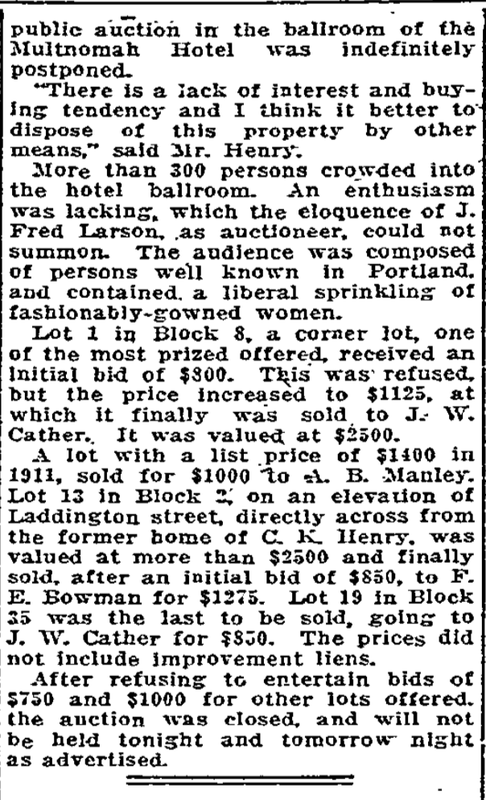 An enthusiasm was lacking, which the eloquence of J. Fred Larson, as auctioneer, could not summon. The audience was composed of persons well known in Portland, and contained, a liberal sprinkling of fashionably-gowned women. Lot 1 in Block 8, a corner lot, one of the most prized offered, received an initial bid of $800. This was refused, but the price increased to $1125, at which it finally was sold to J.W. Cather. It was valued at $2500. 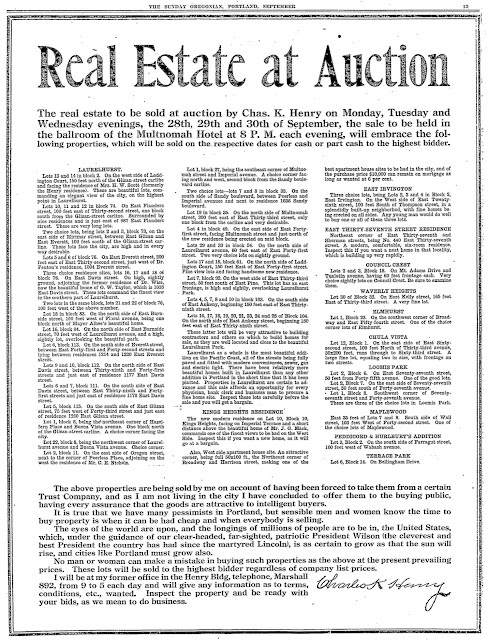 A lot with a list price of $1400 in 1911, sold for $1000 to A.B. Manly. Lot 12 in Block 2, on an elevation of Laddington Street, directly across from the former home of C.K. 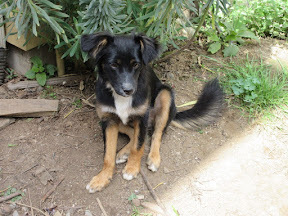 Henry, was valued at more than $2500 and finally sold, after an initial bid of $850, to F.E. Bowman for $1275. Lot 19 in Block 25 was the last to be sold, going to J.W. Cather for $850. the prices did not include the improvement liens. 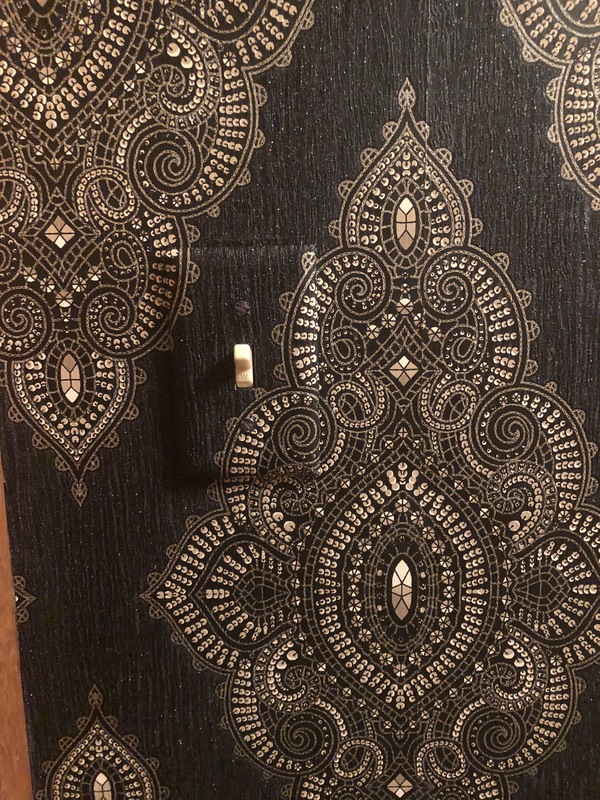 After refusing to entertain bids of $750 and $1000 for others lots offered, the auction was closed, and will not be held tonight and tomorrow night as advertised.